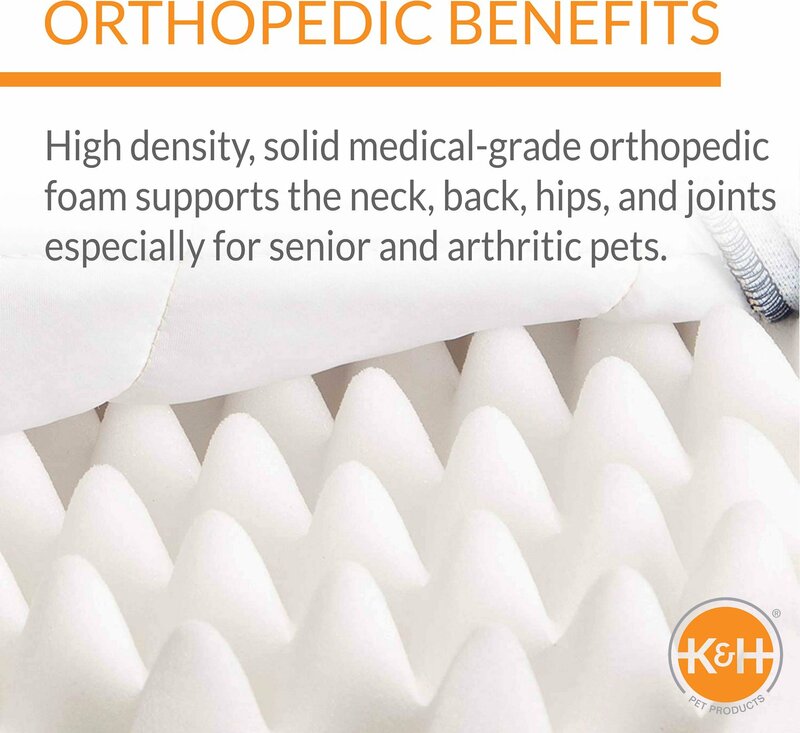 K&H Superior Orthopedic Bed is the ultimate in comfort. 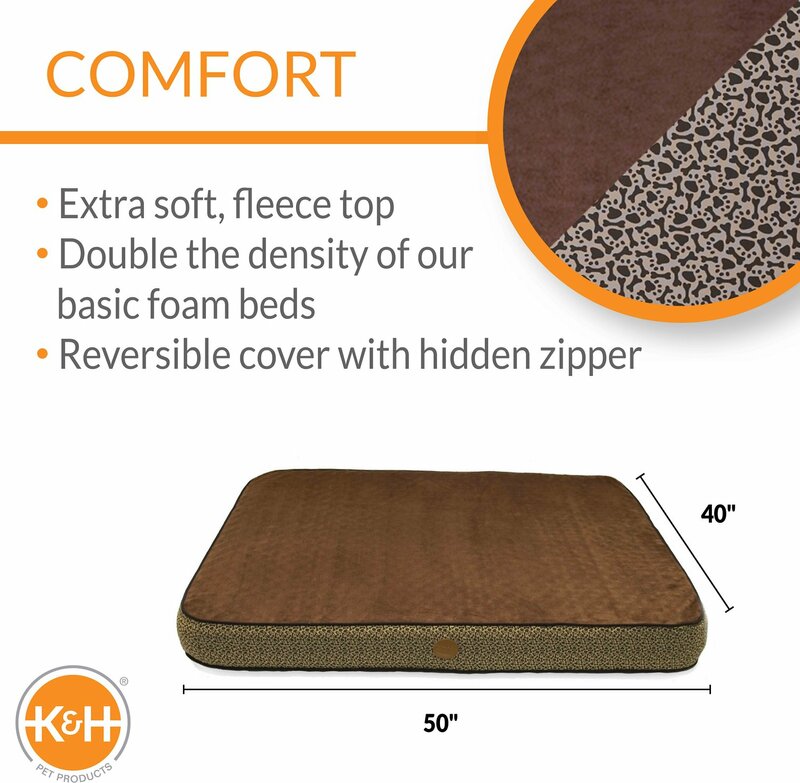 This bed contains 5" of comfort on medical grade orthopedic foam. The bed reverses from attractive poly/cotton print to luxurious microfleece. A truly superior bed! Great for all pets that deserve that extra pampering. 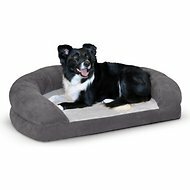 5 inches of medical grade orthopedic foam for a superior, comfortable bed that your pet won't bottom out in. Gently cushions pressure points like shoulders and hips — great for senior and arthritic dogs needing extra support. Removable, machine washable cover for easy care and clean. Reversible: easily converts from an attractive poly/cotton print to a luxurious, soft microfleece. Creative paw print with bone design. 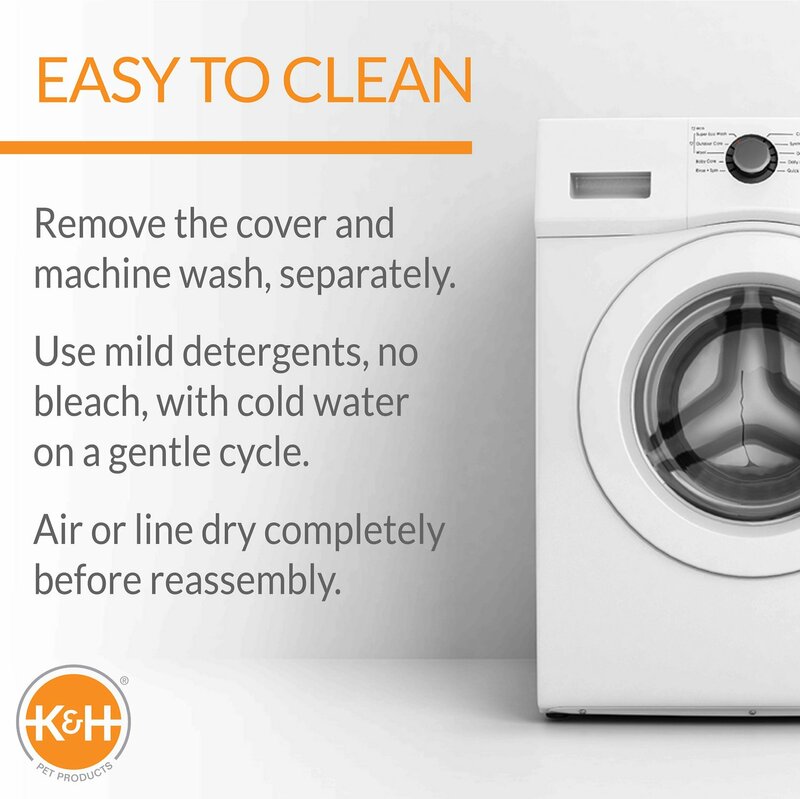 Washing Instructions: Remove the cover and wash it on the gentle cycle with cold water. Line dry or use the no-heat cycle on your dryer. I bought this bed a little over a year ago , and it still going strong, I got it after my dog got in an accident and ended with a femur head implant , he loves this bed , and both my dogs fit in it, I have a 70 pound boxer and 27 pound Boston terrier. The cover is very easy to take off and wash.
As expected the bed was exactly what we wanted, however it was a lot more expensive than the same ones we had previously purchased. Description was accurate. The quality of the zipper was better than I expected. It washes up nice. 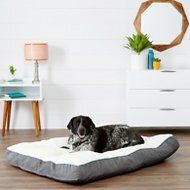 Our red heeler is having some hip issues so I purchased this bed to make it easier on her. She seems to love it. Now I will be purchasing another one for our Corgi. This bed is definitely not an orthopedic bed! It’s super light and there is ZERO support. 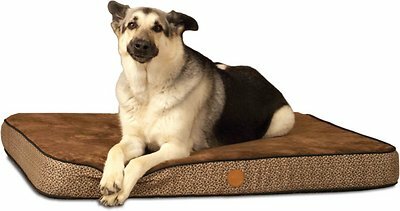 If your dog truly needs an orthopedic bed, skip this one. Total waste of money! I hoped this would be more dense/heavy duty. It's very light, my 39 LB dog is able to fold it in his kennel which is bad b/c he's recovering from knee surgery - he's only allowed to have it when I'm home. It also seems to have squished in the middle. Too expensive for what it is. I received this bed in March 2018 and it already has a hole in the cover. My dog likes to scratch her bed to "fluff" it before laying down and she was able to tear a hole through the cover. 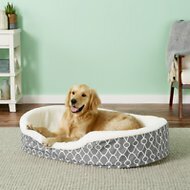 If your dog is not a scratcher or biter, the cover may last longer for you. Also, the bed itself has flattened about an inch. I would not repurchase this bed because of the thin cover. This dog bed is the best one I've had. You can wash the cover and the foam insert fits back in, zip it up and it lays flat. My dog loves this so much, I have one for my office, one for the bedroom and one for our living room!! I have a hard time finding a reasonably priced bed that is big enough for my mastiff. This one did it. And my 11.5 yo girl loves it. Stitching appears appears that it will hold up and the thickness is great. The bed is very nice quality. My 130lb bulldoglays on it and it maintains its shape/support. She used to be restless at night having to get up and readjust her spot. Now she sleeps through the night. Love the bed.